The Atari 400 and 800 were the first home computers to use custom coprocessors and the first to use "sprites" and special video interruptions like display lists, features that will be implemented later on the Commodore 64 and Amiga (Atari 400/800 and Amiga were designed by Jay Miner). It offered high graphic resolution, lots of colors and great sound capabilities, more than other computers could do then ! The two models had same characteristics, the 400 is the low-cost version, it has only 16 KB (instead of 48 KB), one cartridge port (two for the 800) and a membrane keyboard (a typewriter style keyboard one for the 800). Originally, the 400 was sold with 8 KB RAM, but later most 400s were shipped with 16 KB. The 800 was expandable to 48 KB by adding cartridges, as the case opened upwards to reveal 3 slots behind the program cartridge slots. 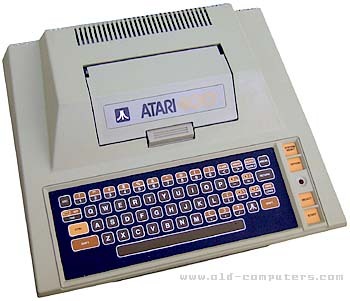 The expansion in the 400 (which had an identical motherboard) was only available by removal of the top half of the case, as it did not open past the (single) program cartridge slot, and was only possible through a registered Atari dealer. The Atari 400 was known inside Atari as code name "Candy". The keyboard was very much disliked on this thing. There were several replacement keyboards on the market. Some connected via cable to one of the ports (and required a TSR program be loaded). Others required you open the system up and replace the actual keyboard. One that I remember was adhesive! It had all the keys on it with "eraser" type rubber things on the underside. You peeled off the backing and attached it over the membrane keyboard. When you pressed a key, the eraser would press the membrane key. As unresponsive as that was, it was still better than the original. The sound on these computers was particularly impressive. Apart from 4 square-wave generators, you could covert them to 2 voices with a far greater frequency range, and the voice generator could also produce general video-game noises very easily - explosions, machine noises etc. At one point a surprisingly good software-based speech synthesizer was developed, to exploit the sound chip. It had to disable all interrupts, especially video DMA, in order to generate the sounds, which rather limited its use. Not many people know that the same sound generator was also used for data encoding when saving programs or data to the cassette or disk systems. see more Atari 400 Ebay auctions !